“Don’t look down,” Peter Zawadzki said as he piloted his 1984 Porsche 911 Carrera up and around a string of tight esses along the mountain’s edge. His soft smile turned into an adrenaline-induced tooth-baring grin as he rounded a clumsily pre-meditated hairpin turn that revealed a quick 35-degree incline. The exhaust crackled as he hastily downshifted to third gear. The car pushed forward and revved up the hill, its rumble whirling into raspy echoes through the forest. The air thinned, and his lungs suddenly felt lighter. He inhaled deeply, then exhaled in a synchronized rhythm broken only by fits of laughter following the side-sweeping sensation of rear tires barely gripping the cold asphalt. His right foot became distinctly heavy, but his knuckles whitened, the blood supply cut off by a death grip around the polished wooden wheel. The car ate up any generous offerings of fuel with gusto until Peter came to the first stop sign seen in 10 miles. It was all downhill from there. Bonding with a machine and seeing the world one mile at a time can be a life-changing experience, but it’s the people who make organized group driving tours so unforgettable. Hagerty’s Touring Series, specifically the most recent “Amelia or Bust” edition, opened my eyes to the importance of driving with other enthusiasts. On a good day, it's therapeutic, grounding and uplifting – it heals the soul. Even if something goes wrong, the endless supply of comradery, teamwork, and support from friends new and old can quickly turn a breakdown into a positive ordeal and a memorable story to tell for years to come. When participants trickle into each destination, typically a lunch, dinner, or special museum stop, friends new and old immediately fall into excited chatter about their individual experiences during the journey. Peter chimed in; “Did anyone else hit that hairpin turn followed by a steep incline?” To which one driver replied, “Oh, yeah! That’s the corner where I locked up the brakes. My poor four-cylinder barely had the momentum to make it up the hill.” “I’m going to smell baked brakes for days,” another driver joked. During the five-day, 1,500-mile tour, drivers and co-drivers worked together using a route book and odometer readings (or in some cases not) to navigate through dead service areas on the most desolate and entertaining back roads. How tour organizers like Dave Hord, owner of Classic Car Adventures, find such breathtaking roads fit for the art of driving is beyond me, but I suspect it’s much like searching for hidden treasure. The Amelia or Bust Tour took a group of around 35 cars and over 50 participants through six states, beginning in Allendale, Pennsylvania, and ending in Amelia Island, Florida, in time for the Amelia Island Concours d’Elegance. Scenery and road conditions changed with the rising temperatures as we traveled south. With March still being early in the season, the northern part of the drive began with spots of snow, occasional patches of ice, and residual sand which was thrown down for traction, particularly in the higher elevations, but the landscape was indescribably beautiful. Above: 964-generation Porsche 911 Turbo. The emotional impact evoked by such scenery makes phrases like “jaw-dropping” or “awe-inspiring” seem cliché. Virginia displayed velvet-white blankets of snow over contrasting creeks, forests, and rock formations. The Carolinas brought dramatic waterfalls and temperatures just cold enough to form icicle sculptures that carried the sun’s reflection. Ice-infused mountain tree tops were replaced with flowering bulbs, budding bushes, and vibrant copper-red soil as we drove through Georgia, and then, finally, we were welcomed to Florida by sunbaked palms. The once crisp, cold (a.k.a. frigid) and mostly unsullied mountain air transitioned to smells of fresh cut lawn and farmer’s cologne, a double-edged sword for the brave souls who drove convertibles. 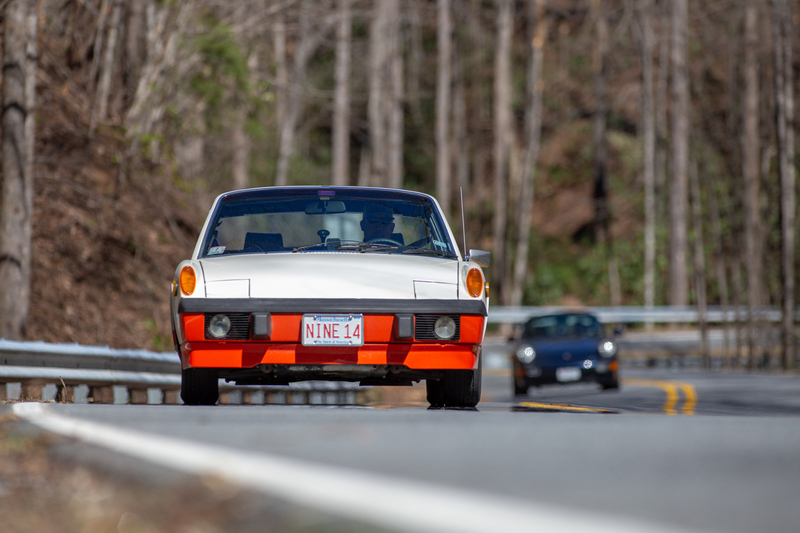 I spent a half-day co-driving in David Geisinger‘s Limited Edition 1974 Porsche 914. We passed forgotten villages and vast fields home to cows who would pause as we cruised past, their large brown eyes following the line of cars down the road. The car couldn’t have been happier. It earned its bragging rights as “the little four-cylinder that could” after tackling hill-climbing twisties. At one point, just before cresting a hill, David and I rocked forward in unison in hopes for extra momentum. We were acting silly, of course. Just days later, David’s 914 won the Werks Reunion Porsche Corporate Award held by the Porsche Club of America at the Amelia Concours d’ Elegance. If you still need more convincing after that heartfelt recap, let me say that driving in a tour is an ideal way to experience different vehicles that you might not otherwise have access to. You might even find your next dream car, like Dave (below). Or maybe you’ll fall in love with your own all over again. Dave Hord piloted a borrowed 1987 Porsche 911 Carrera the entire trip, except for when he jumped into Peter’s tastefully updated ’84 911 for a short leg, thereafter reporting with much enthusiasm that Peter’s car did indeed feel lighter and was quicker to turn and brake.